We've reached the mobile tipping point, with online time spent on smartphones and tablets surpassing time spent on the desktop. 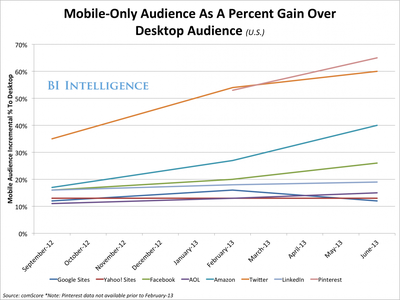 For some activities, the break toward mobile is even greater. This change has huge implications for various media, as businesses adapt to changes in consumer behavior, and capitalize on new opportunities on mobile. The media categories that have seen the most dramatic transition to mobile so far are social networking, mobile video, local search, and, of course, gaming. In a recent report from BI Intelligence, we explore where growth on mobile has come from so, and which media activities will see the most explosive growth in the future. We discuss how tech companies, social networks, and app developers are shifting business models to accommodate their growing mobile-centric user bases, and who the big winners are in this transition. This report is an update to our popular January 2013 report on mobile usage, which discussed the rise of gaming, mobile-social synergies, the mobile takeover of existing popular usage categories, and portal erosion. Mobile usage is at an all-time high. In fact, we've reached a usage tipping point. Consumers are spending more time on mobile as they are in the traditional online category (which includes all activity on desktops and laptops). 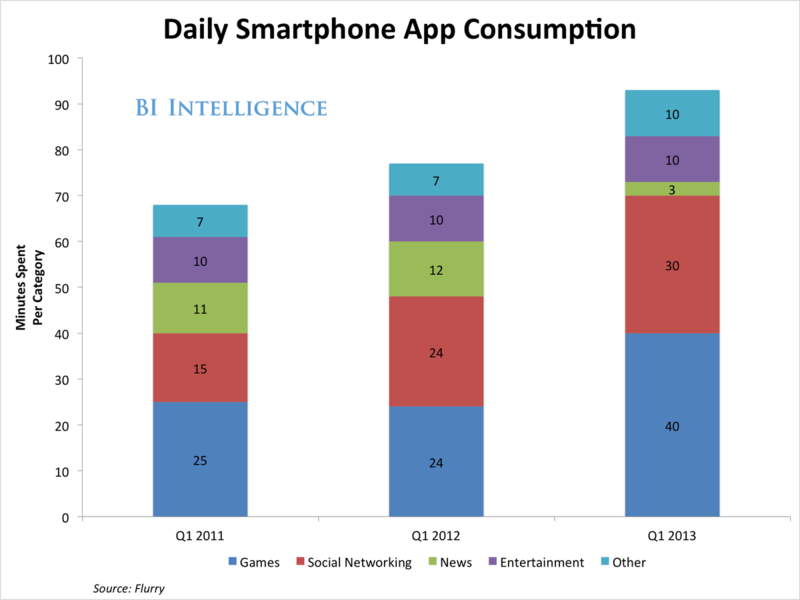 Mobile was the only media type to grow in total U.S. consumer minutes spent per day from 2010 to 2012. In the course of 2013, tablet shipments have grown 83% while PC shipments dropped 13%. Mobile video is already big, but it's poised to become even bigger. Why? One key trend is that not only are consumers watching more videos on mobile devices overall, they're also sticking to their mobile devices for longer periods of time while watching. This gives marketers more time and opportunity to place ads within streaming video content. Pinterest’s U.S. mobile-only user base grew 28% reaching 18.3 million in June 2013. And Facebook in particular has made significant progress monetizing this growing audience: mobile advertisements represented at least 41% of its ad revenue in the second quarter of 2013. Search is also becoming increasingly mobile. Tablets and smartphones already accounted for 26% of all local search traffic at the end of last year. Yelp has been one huge beneficiary of increased local-mobile searches. Google's dominant search engine is still taking the lion's share of local-search ad dollars, but Google's threatened by stand-alone apps like Yelp that attract specialized searches. Every search on Yelp for a local Chinese restaurant is a lost revenue opportunity for Google, and we expect local-mobile to be one area of tumult and increased competition in the next couple of years. The full report provides in-depth analysis and detailed data on these trends, including a dozen charts with underlying data sets that subscribers can download and put to use. For full access to this report along with dozens of in-depth mobile industry reports and a library of hundreds of charts, sign up for a two-week free trial of BI Intelligence.